Lacto-Misr Company for the Production of Baby Milk powder & Food is a joint stock Company established on January, 2000.Upon idea, technology transfer and promotion of its Chairman Dr. Ibrahim Ezzat Starting production on September, 2002 . Lacto-Misr Located in the industrial zone at the 10th of Ramadan City on area approximately 31000 m2. 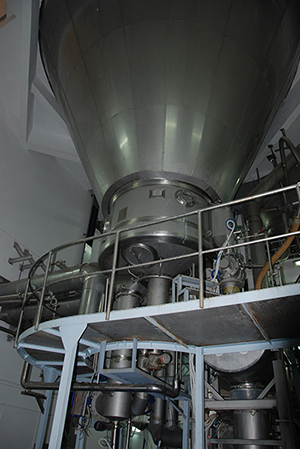 Lacto-Misr is the first plant in Egypt, the Middle East & Africa to produce Baby Milk Powder. The technological engineering and equipments supplies are from Vogel Busch Gmbh Company, Vienna which is one of the biggest famous company specialized in the supply, design, engineering and supervision for companies using high technological application and with the participation of the Egyptian engineering experience which has accomplished this great industrial firm. The plant is designed also to produce special baby food , supplements and food ingredients and is equipped with the most advanced Austrian & German technology in the field of Baby Food Production and food ingredients. All equipments are controlled automatically under the supervision of highly experienced Egyptian specialists. The Know-How for Baby Milk was obtained from one of the major German companies which are considered one of the few worldwide companies in the Baby Milk Production. It was obtained by Milchwerke Mittelble GMBH with cooperation and assistance of Vogelbusch Co. – Austria. The annual production capacity of Lacto Misr is about 35 million tins from baby milk powder as well as 15000 tons from Non-Dairy Creamer powder and Topping Base powder to cover the local needs & export the surplus to the Arab Countries, Mediterranean, Middle East & Africa. The plant is designed with a new feed system for the dryer. A system that optimize and allow for continuously operation and increased yearly line capacity. Lacto-Misr created a total quality management system which enables to be ISO 9001:2015 for Quality Management System,FSSC 22000:2017, ISO 22000:2005 for Food Safety Management System, OHSAS 18001:2007 for Health & Safety Management System, ISO 14001:2015 for Environment Management System, ISO/IEC 17025:2005 for Quality Control Laboratory and Halal Certificate. Lacto Misr applies these systems through highly skilled & well trained personnel to execute the strategic and sophisticated technology used in manufacturing process, inspection, control procedures of our various products which guarantees the quality & safety of our products. Lacto-Misr has the capability and high capacity for Toll manufacturing, and to arrange production of any desirable baby formulas and Food Ingredients for other companies . Lacto-Misr is one of the most technologically advanced manufacturers and innovators in specific food ingredients designed to meet the needs of our customers around the world. Our products are being exported to many countries in the Middle-East region, Arab countries and Africa and we are looking forward to cover the whole region. Our aim in Lacto-Misr is to secure the supply of safe & reliable baby milk , food supplements and food Ingredients to local and International Market .